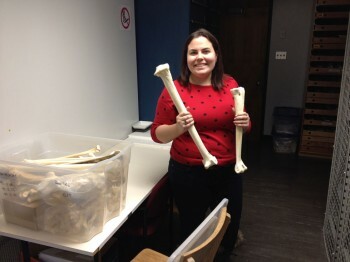 The author holding the tarsometatarsus and the tibia of an ostrich. My life changed significantly in the past few months. I started a new degree, in a different country, in another language. The Center for the Advanced Study of Hominid Paleobiology has proven to be stimulating in many ways; one of the highlights being the guest speakers invited periodically. My very first CASHP seminar was given by Dr. Suzana Herculano-Houzel. In essence, she challenges the idea that the human lineage has an abnormally large brain compared to other animals. Her take-home message got me thinking: Is there any trait that is exclusive to humans? Paleoanthropologists tend to say that bipedality is a novelty of the human lineage1. In a nutshell, a biped is an animal that walks or runs using exclusively its hindlimbs2. It is in fact common in the animal kingdom: insects (Periplaneta spp. ), reptiles (Basiliscus basiliscus, Callisaurus draconoides), kangaroos (Macropus spp. ), some primates, many rodents and most importantly all birds are known to use some form of bipedality. Should all bipeds be grouped in the same category? Certainly not. Some animals are obligate bipeds, some use this form of gait only in particular circumstances. In addition, most birds hop rather than walk per se. Interestingly, a group of birds has a terrestrial locomotion with alternating limbs, not unlike humans. They are the Palaeognaths, which are primitive, mostly flightless birds. The extant members of this Superorder are ostriches (Struthio spp. ), emus (Dromaius spp. ), rheas (Rhea spp. ), kiwis (Apteryx spp.) and the colorful cassowaries (Casuarius spp.)3. Of course, birds and humans have followed very distinct evolution trackways. Because of that, their locomotory anatomy is completely different in many aspects. For instance, ostriches are cursorial animals, and therefore walk on their digits, not their sole. They also have a much shorter femur. But humans and ostriches also share striking similarities. For example, one of the digits of the ostrich is reinforced and is thought to play a role in propulsion, much like the human hallux4. This article is neither revolutionary nor exhaustive, but it is a necessary reflection on our place in nature. 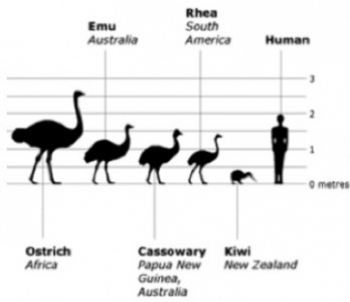 Learning more about the strategies employed by other animals, especially when they have a mass somewhat similar to that of humans (i.e., emus) could potentially give insights into the precise reconstruction of the gait of extinct species. 1 For example: Lovejoy, O. (1989). Quand l’homme se leva… Pour la science, 135, p.64. 2 Alexander, R. M. (2004). Bipedal animals, and their differences from humans. Journal of Anatomy, 204, 321-330. 3 Hackett, S. J., Kimball, R. T., Reddy, S., Bowie, R. C. K., Braun, E. L., Braun, M. J., . . . Yuri, T. (2008). A phylogenomic study of birds reveals their evolutionary history. Science, 320 (5884), 1763-1768. 4 Alexander, R. M., Maloiy, G. M. O., Njau, R., & Jayes, A. S. (1979). Mechanics of running of the ostrich (Struthio camelus). Journal of Zoology, 187(2), 169-178. Polk, J. D. (2004). Influences of limb proportions and body size on locomotor kinematics in terrestrial primates and fossil hominins. Journal of Human Evolution, 47(4), 237-252.